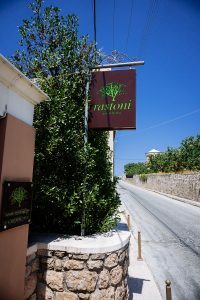 One of the Rastoni staff members, Marilena, explained that the word rastoni is Cretan and means to relax in a lazy yet calm kind of way. It turned out to be a great name choice. After we got off the fast ferry from Athens, we walked about 400 meters through a residential neighborhood to find the Rastoni. 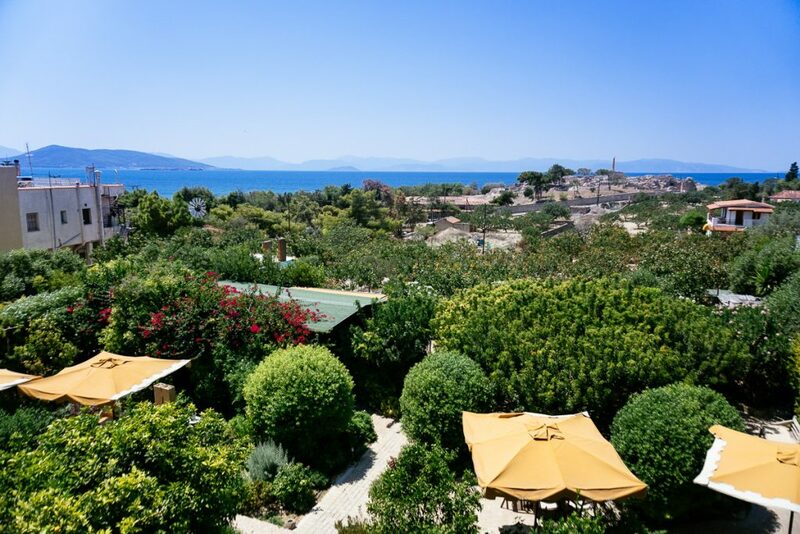 It was interesting to learn that the hotel was built on an old pistachio farm (Aegina is famous for its pistachios). 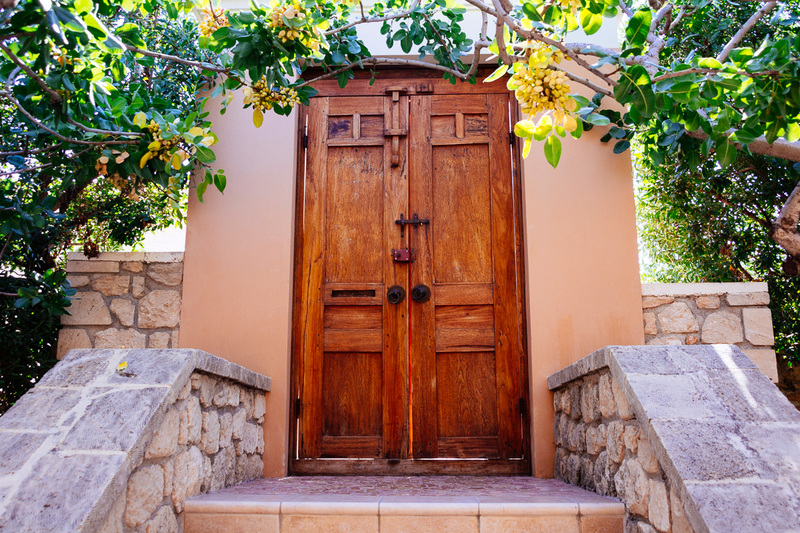 Heavy carved wooden doors opened up to a courtyard entrance decorated with Hellenic style stone pots. 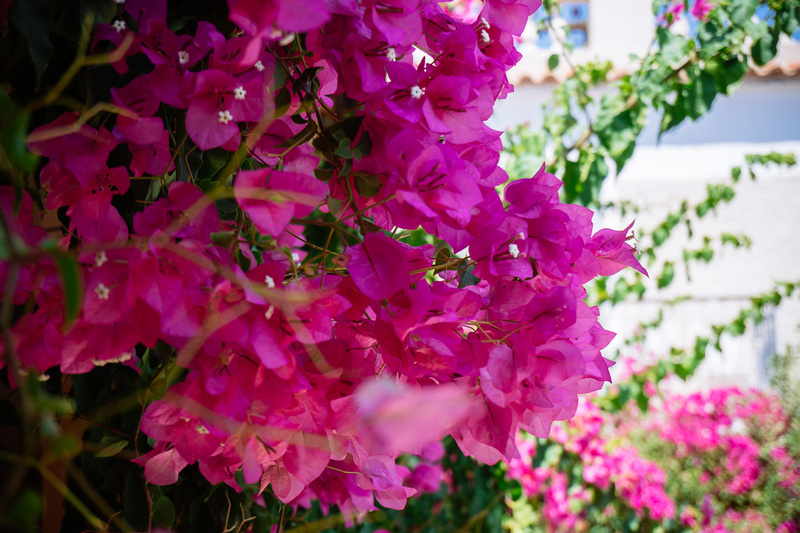 Shocks of fuchsia bougainvillea hung over earth tone painted walls. The lobby area’s simple layout and local artwork gave off a welcoming vibe. A back door lead out to one of the Rastoni’s prized features: a beautiful garden. 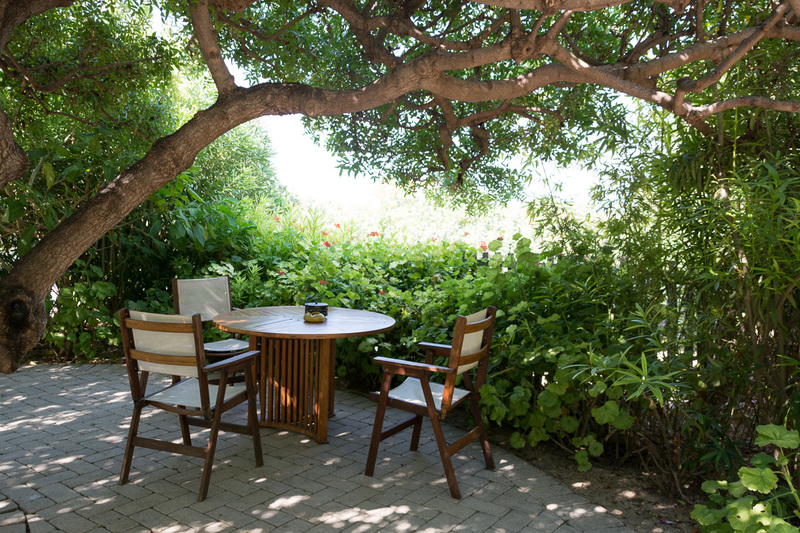 Covered in cool shade from pistachio trees and other greenery, it featured sun loungers, dining tables, small waterfalls as well as sitting areas set with wooden benches perfect for relaxing or reading a book. 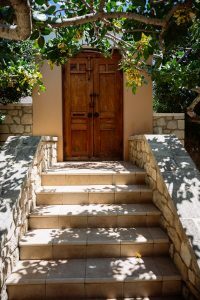 Besides being within a 10- to 15-minute walk to Aegina Town and the port, the Rastoni is also within walking distance to a beach and one of the archaeological sites of the island, the Kolona. Our sea view loft was just perfect. 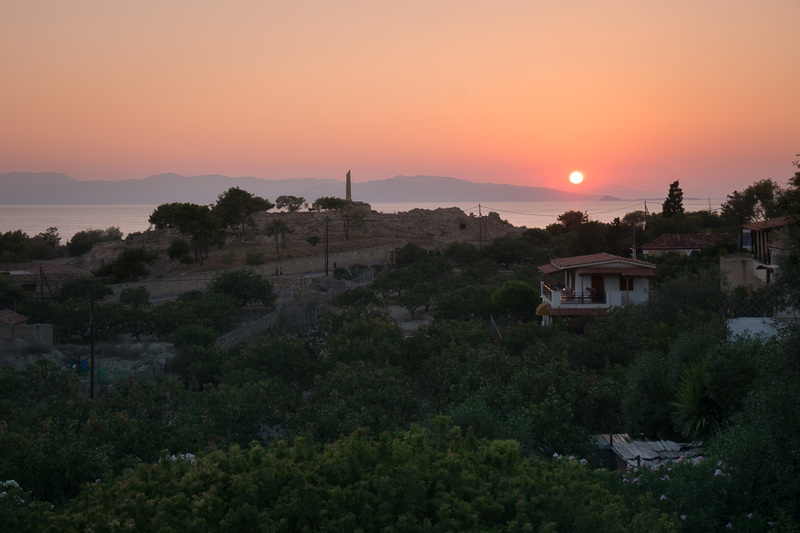 I admired the sunset, the sea and the archaeological site as I lounged back on my balcony chair. Rooms were decorated in colonial island style with thick wooden furniture and local paintings. Our room also had a small kitchenette, a comfortable queen size bed and desk. 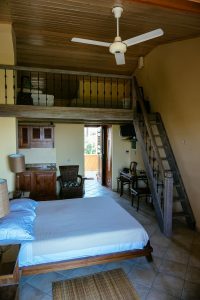 Two single beds took up the upstairs portion of the loft. We tried to crank up the air conditioning as much as we could since we happened to be on the island during a heat wave of 100 F plus temperatures. 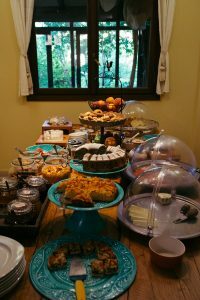 The buffet breakfast at the Rastoni made me want to bake again! 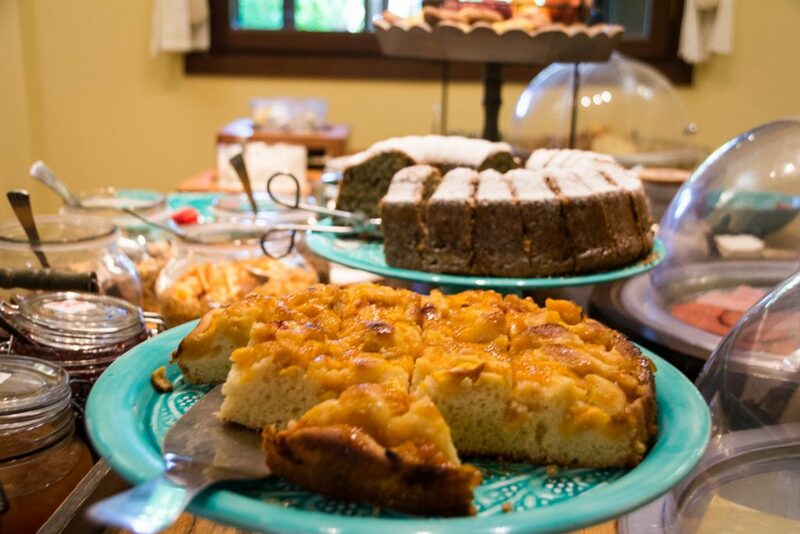 Each morning a generous spread of freshly made cakes lined the table. 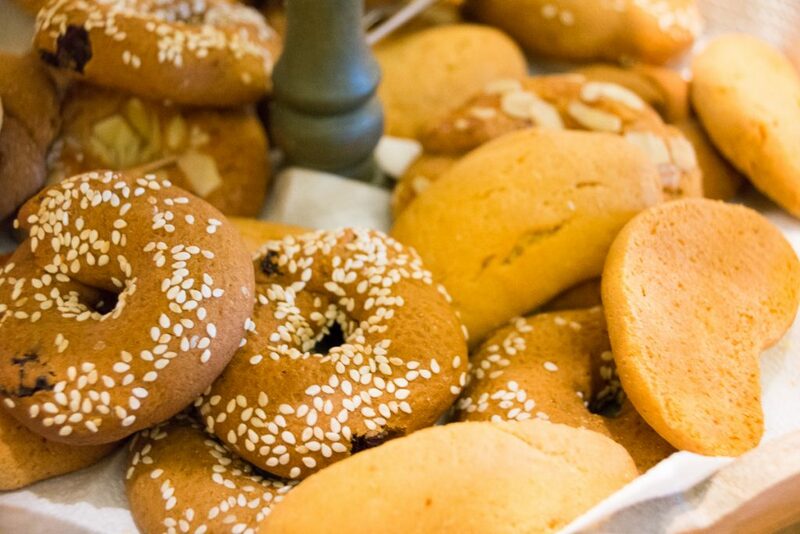 I’m talking about delicious Greek style apricot, apple and vanilla cakes. Savory breakfast choices like quiche, bread, eggs and local cheese were also on offer. Then there was classic Greek yogurt, honey, jam and fresh fruit. Regular filter coffee was readily available but we also ordered freshly made freddo cappuccinos (a type of iced Greek coffee) each morning as well. Although it was super hot, it was nice to sit out in the garden under the shade and enjoy breakfast there. 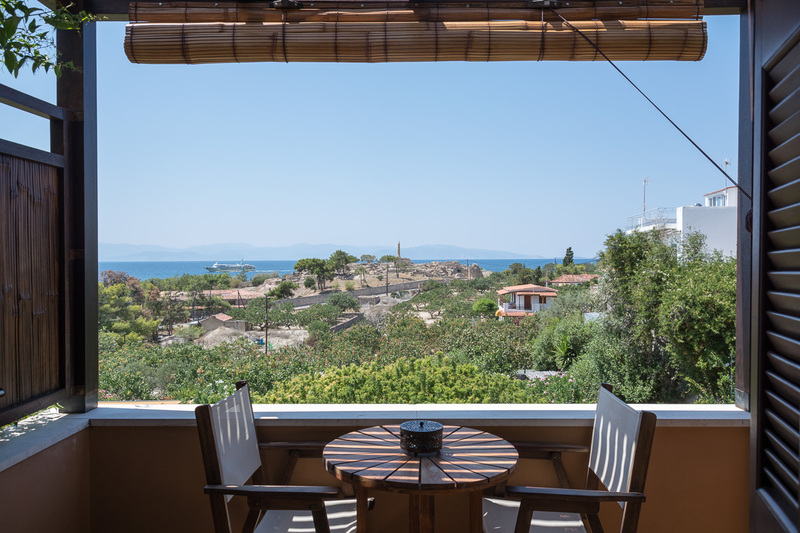 I found the Rastoni to be a convenient stay due to its proximity to Aegina’s main town and the port. We easily walked everywhere we wanted to go. We had dinner in Aegina Town each night and enjoyed the walk back to the hotel. 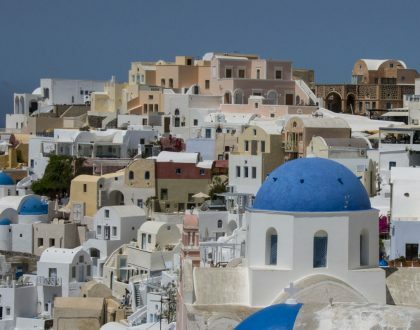 We also walked to the port one morning to catch a boat to Moni island for a day trip. 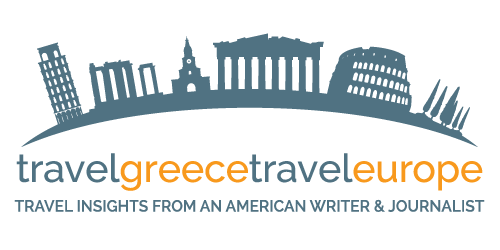 Staff was hospitable and knowledgeable about Aegina. 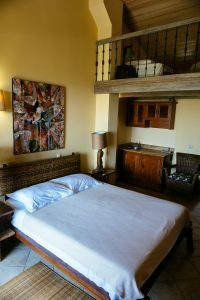 They can book relaxing massages, bicycle rentals and tell you about the hiking routes. I highly recommend booking a sea view room with that fantastic sunset and ancient historical sight view – all in one. Finally, thanks to my stay at the Rastoni learned a new Greek word and what a way to learn it! 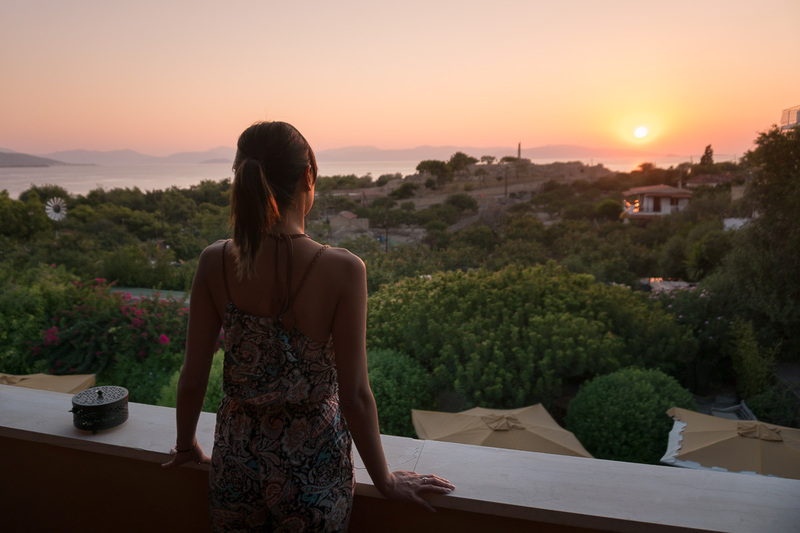 I definitely had moments of rastoni — a lazy kind of relaxation that went hand in hand with a memorable sunset view. 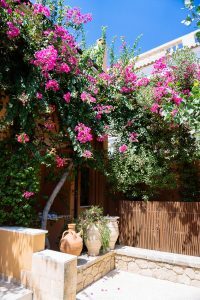 For a charming, welcoming getaway stay on Aegina, the Rastoni is a fantastic choice – and a great bargain on one of the closest islands to Athens. 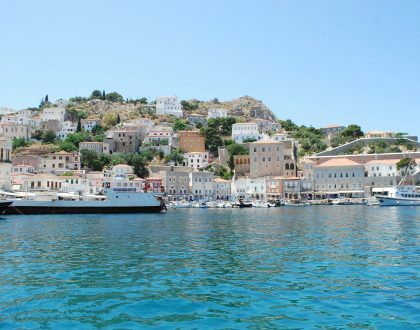 Aegina’s port and Aegina Town is within a 10- to 15-minute walk. Free private parking is possible on site. 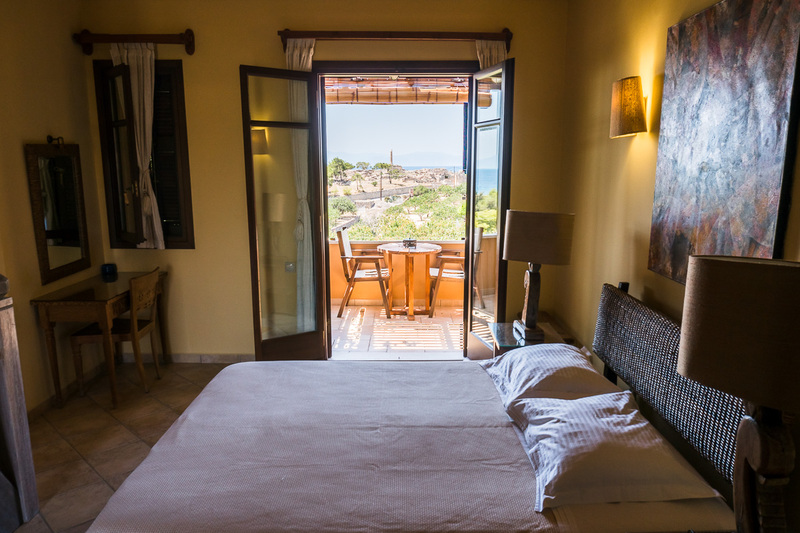 Double rooms starting at 80 per night in low season, 160 in high season. Click here to check availability and the best rates at the Rastoni. 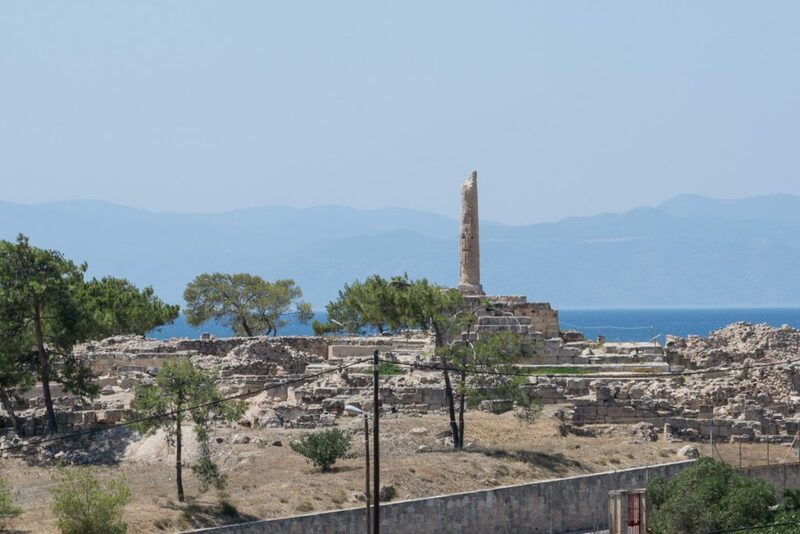 Have you ever visited Aegina?